New figures show that 180 women travelled from Scotland to England for an abortion last year. The British Pregnancy Advisory Service said this highlighted the difficulty in obtaining late-stage terminations for women north of the border. The law currently allows the procedure up to 24 weeks of pregnancy, and 73 of the 180 women who travelled south were at least 20 weeks pregnant. 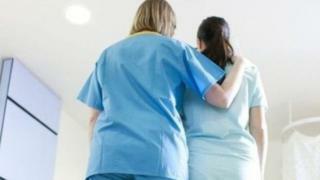 The Scottish government said it was looking at improving abortion services. There were a total of 12,063 abortions registered in Scotland in 2016. Campaigners say women choose to have an abortion after 18 weeks for a variety of complex reasons, including foetal abnormality, changes in domestic circumstances or ill health. Late-stage terminations can be carried out either surgically or medically. Surgical terminations involve the physical removal of the foetus under anaesthetic, while medical abortions are carried out with the use of drugs to bring on miscarriage. The use of medical methods rather than surgical methods has continued to increase in Scotland, with 82.9% of terminations performed medically in 2016. The difficulty for women from Northern Ireland in accessing abortion has been much highlighted. Abortions are illegal there, except for cases where the woman’s health is at risk. That has led to women travelling to Great Britain seeking terminations. However, one woman – forced to travel from Scotland to London for an abortion at 22 weeks – described this to me as “Scotland’s dirty little secret”. The law says abortion can be carried out across mainland Britain up to the 24th week of pregnancy. But the reality – as today’s figures show – is its very hard to obtain in Scotland after 18 weeks. That’s the cut off point most health boards in Scotland set for abortions sought for social reasons. For those they need to travel to clinics in London and Liverpool, though they can reclaim funding from the NHS. Also little understood is that women seeking abortions for medical reasons in Scotland are unlikely to be offered the surgical procedure after 14 weeks. The vast majority of abortions – almost 83% last year – are now medical, which involves taking two sets of pills and waiting for the pregnancy to pass. However, some women over 14 weeks don’t want to go through what they see as the added trauma of going through labour and would prefer the surgical option. Again, for that they often have to head south. Patients who are referred to hospitals in England by their health board will have the cost of their treatment paid for by NHS Scotland. Ann Furedi, the chief executive of the British Pregnancy Advisory Service, said that while it was difficult for women to obtain surgical abortions anywhere in the UK, it was extremely difficult in Scotland. She said: “In England it tends to be provided by independent clinics, such as BPAS, who are specially commissioned by the NHS to provide that service. Ms Furedi said that because Scotland was traditionally better at providing the earlier procedure, the provision of later procedures never really developed. She added: “I think that historically that’s also been fuelled by the mistaken notion that if you provide a good service early in pregnancy the women won’t need a later abortion service, which is simply not the case. A recent study found wide variations in practice between Scotland’s health boards. The Scottish government said it was working to improve services. It said: “The Scottish government is continuing to work with NHS boards to look at how improvements can be made to abortion services in Scotland.